of Maidstone, Kent. 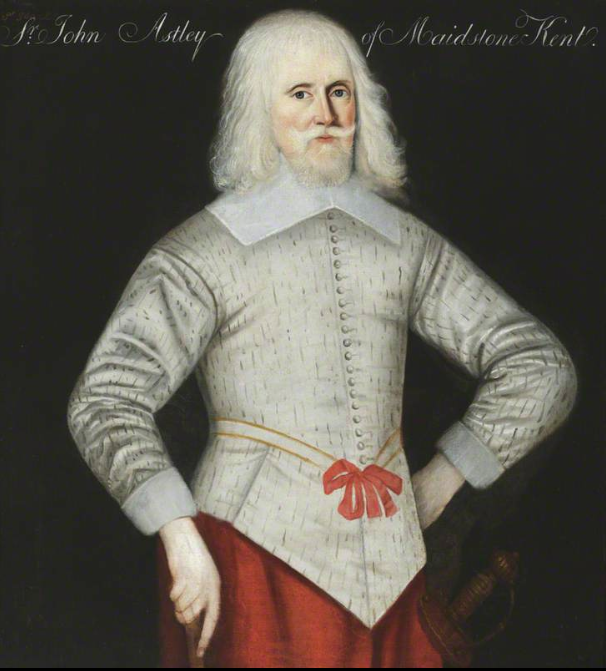 Painted by an unknown artist in the 1630s, Sir John had been Master of the Revels to both King Charles I and his father James and by this time was an old man with grey hair as we can see. 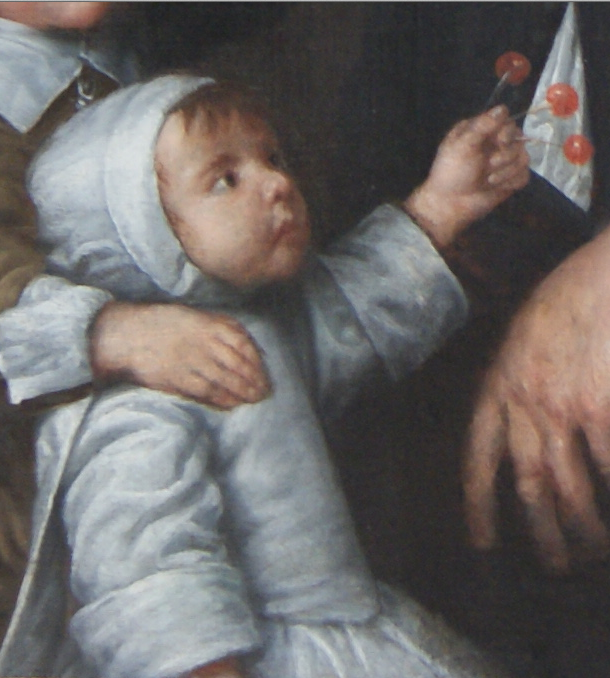 He wears a rather splendid white satin doublet that has been slashed or pinked in the body, sleeves and tabs. This was an old fashioned treatment, having been very popular in Tudor times, but I suppose Sir John was an old fashioned type of guy. A white ribbon has been tied where his sword belt should go with a red bow at the centre point. Strangely he is still wearing a sword, though with no visible means of suspension. Maybe it’s just resting against his leg. A very simple plain band and cuffs make up his linen and he has a contrasting pair of red breeches. The picture is under the care of the National Trust at Seaton Delaval Hall, Northumberland. 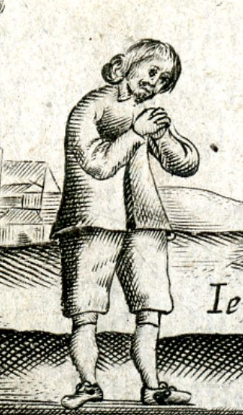 This fellow in coat, breeches and shoes represents repentance, as you can tell as he has no headgear. 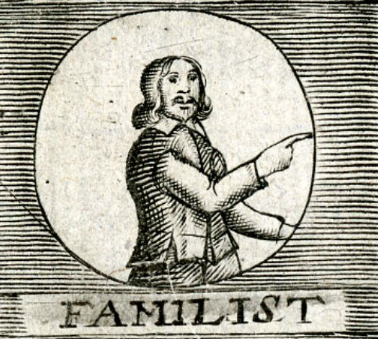 This guy is a “familist” who were a sect that followed a Dutch mystic called Hendrik Niclaes who were eventually absorbed into the Quaker movement. Short tabbed doublets seemingly were worn too. A divorser. 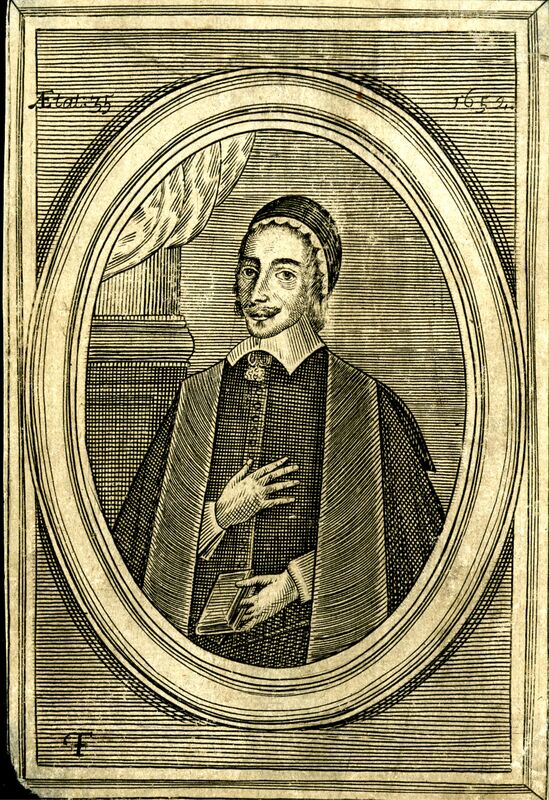 Not actually a sect, but according to Pagett: “That will put away their wives for small offence not regarding the word of our Saviour Mat. 19.9. 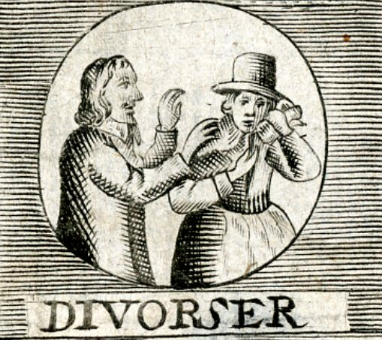 That whosoever shall put away his wife, except it be for whoredome, committeth adultery, and whosoever marrieth her that is divorced committeth adultery.” The divorcer in a coat and his wife wears a petticoat and bodies with a tall hat. 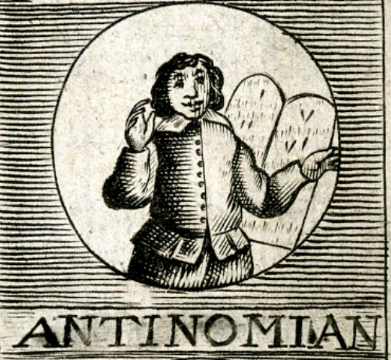 An antinomian. Whilst also not a sect as such, an antinomian believed that faith alone was necessary for salvation. This guy looks pretty self-righteous in front of the ten commandments, which presumably he is flouting and relying on his true faith. Short tabbed doublet and breeches. 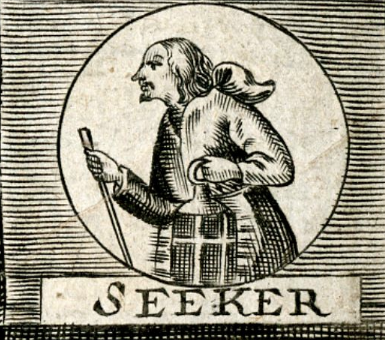 A seeker. 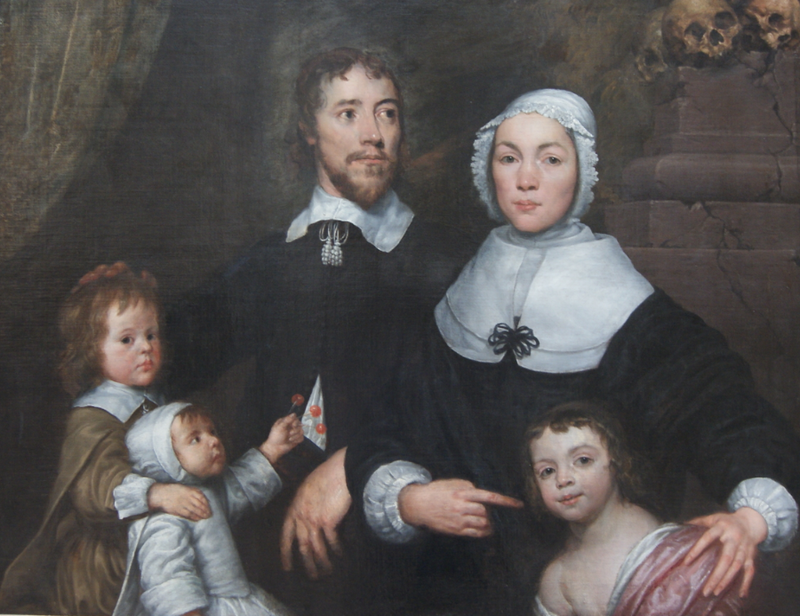 They believed that all organised religion was corrupt and preferred to wait for God’s revelation to come to earth and it has been argued that they were the precursors of the Quaker faith. Not at all sure what he is wearing. A hoodie perhaps? It’s certainly some kind of garment that pulls over the head rather than buttoning up. Destruction graphically represented. This kind of scene was playing out all across the country. or a Treasury of 53 Rare Secrets and Arts Discovered by an Expert Artist, Richard Amyas. 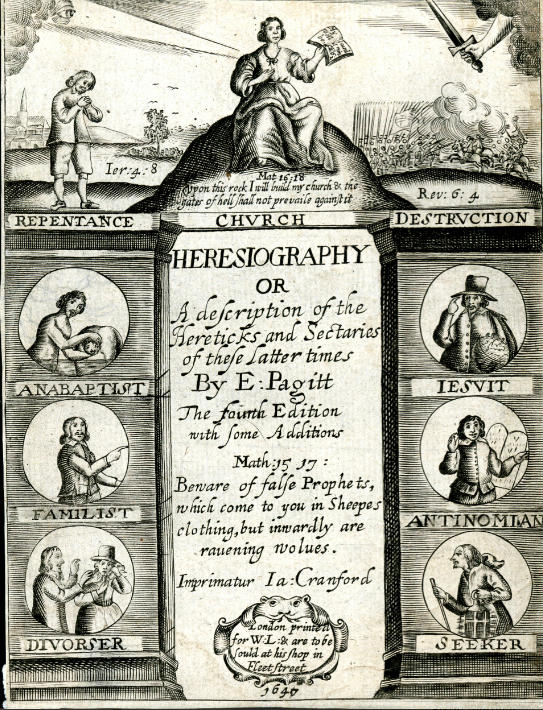 Published in 1659. 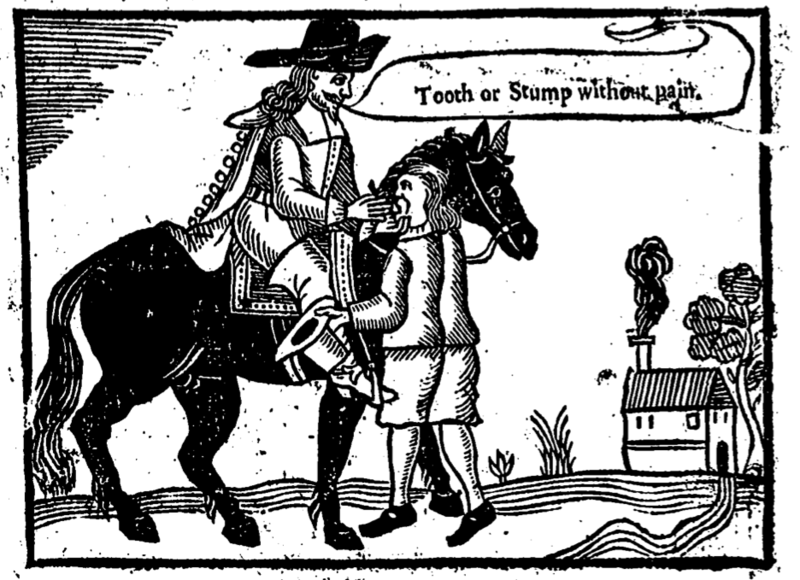 Another handy book of secret recipes and hints, most of which probably wouldn’t work, but there’s a nice woodcut on the cover showing a chap having a tooth extracted by a dentist seated on a horse. I notice the patient has had the presence of mind to remove his hat in the presence of his better. Anyway the chap on the ground wears a loose doublet and ungathered breeches, basic unheeled shoes, hose and carries a tall hat in his left hand. The “dentist” is more fashionably clothed in fitted doublet, breeches, large falling band and a cloak with buttons all the way down. A good pair of riding boots on his feet and a large brimmed hat on his head. Maybe the patient would have been better to read the book? Boyl the root of Henbane in white-Wine Vinegar; bruise the root, and hold it between the Teeth, as hot as the party can suffer it, and hold your head over the fume of it, and keep your head warm, it wonderfully easeth. 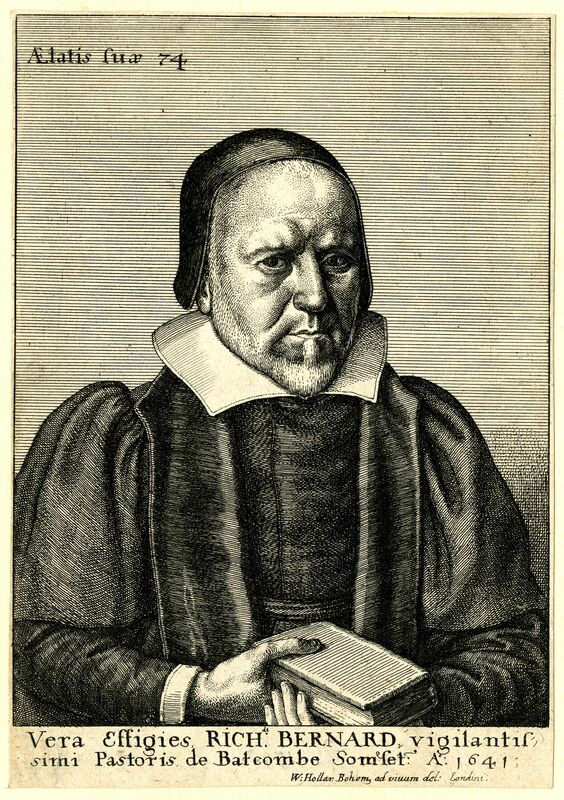 From an earlier set of engravings by Hollar, Ornatus Muliebris, published in a book in 1640. 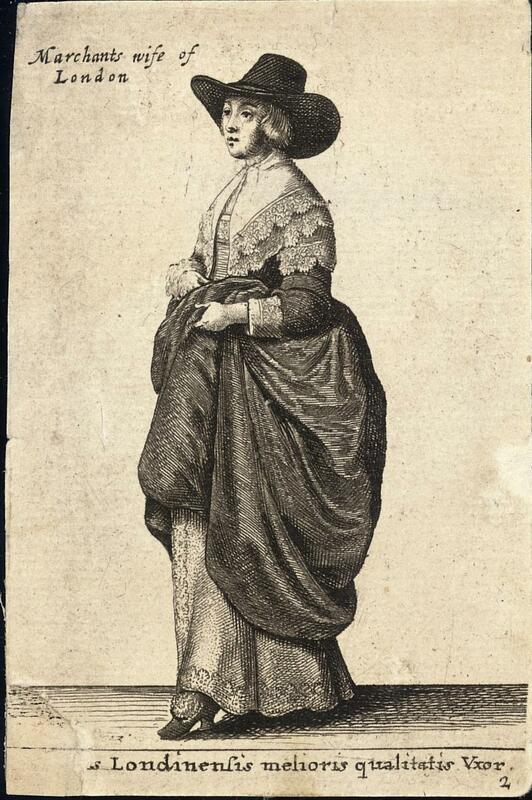 These were exclusively English women, mostly pretty high class, but this one is supposed to be a servant of the kitchen, although she must be in her Sunday best as there is a lot of decorative edging here. She has a lace edged coif on her head, plain linen neckerchief and a waistcoat with gathered sleeves that have some decoration, possibly applied embroidery or simple lace. She has two petticoat skirts, the outer one is also decorated along the lower edge. Her shoes are heeled and fashionable and are raised up on pattens to keep her out of the mud. In her basket are artichokes and some kind of root vegetable, possibly purple carrots or radishes. Is this a servant or someone of higher status pretending to be a kitchenmaid. Who knows? 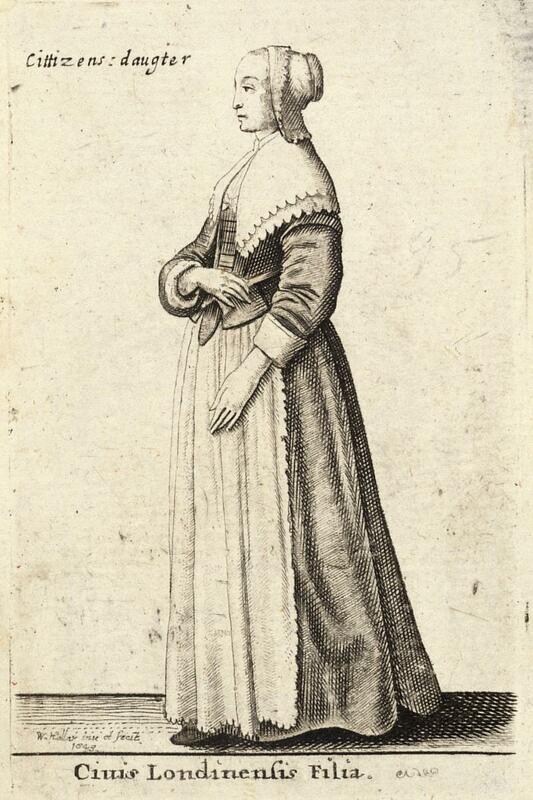 Also from Theatrium Mulierum 1643 by Hollar, this is a younger girl also dressed in good quality simply cut clothes. A linen coif edged with lace and folded back to show a fringe of hair on her head, double layer linen kerchief edged with scalloped lace, a boned and front-lacing bodice with plain linen sleeve cuffs, single layer petticoat and a plain apron. 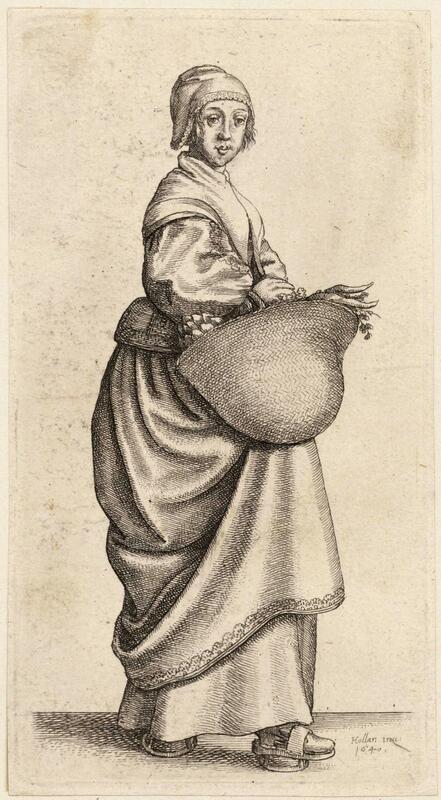 Engraved by Hollar as part of his collection of costume images from all over Europe called Theatrium Mulierum, first published in 1643. 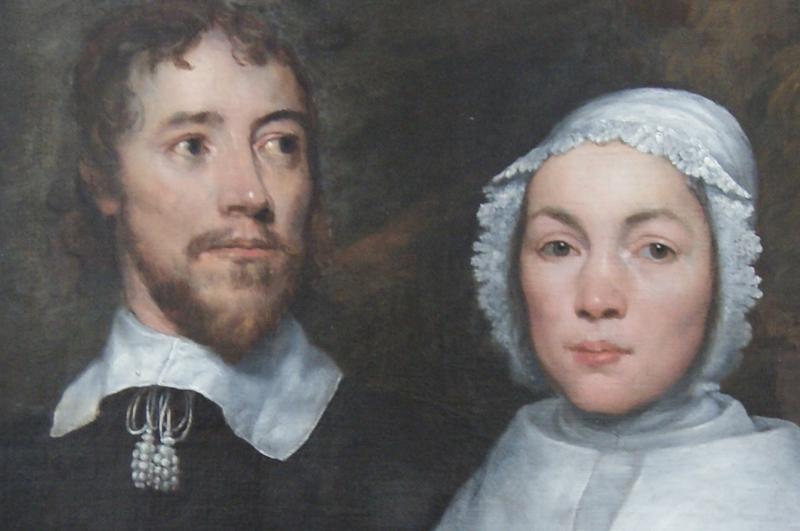 The merchant’s wife wears a wide brimmed hat with loose hair, a three-layer lace edged neckerchief over a boned and laced bodice. her under petticoat skirts look like they are lined with some kind of lace or simple embroidery and the outer petticoat of some kind of satin fabric, possibly silk. Her shoes are fashionably high heeled and she has ribbon rosettes over the fastenings. A prosperous lady, though not high class, she is well dressed for the city. Or, the faithfull pourtraicture of a loyall subject, in vindication of Eikon basilike. Otherwise intituled, the pourtraicture of His Sacred Majestie, in his solitudes & sufferings. In answer to an insolent book, intituled Eikon alethine: whereby occasion is taken, to handle all the controverted points relating to these times 1649. As the title suggests this was an reaction to Eikon Alethine which declared that the King’s book Eikon Basilike wasn’t actually written by the King. 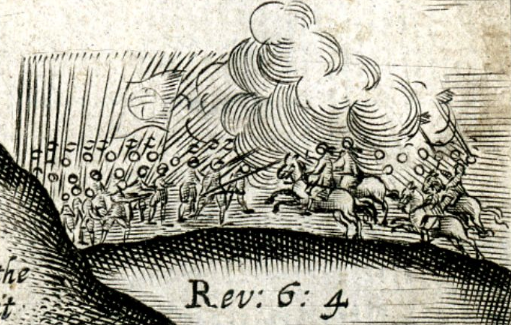 The picture is also an answer to the frontispiece of the previous book. 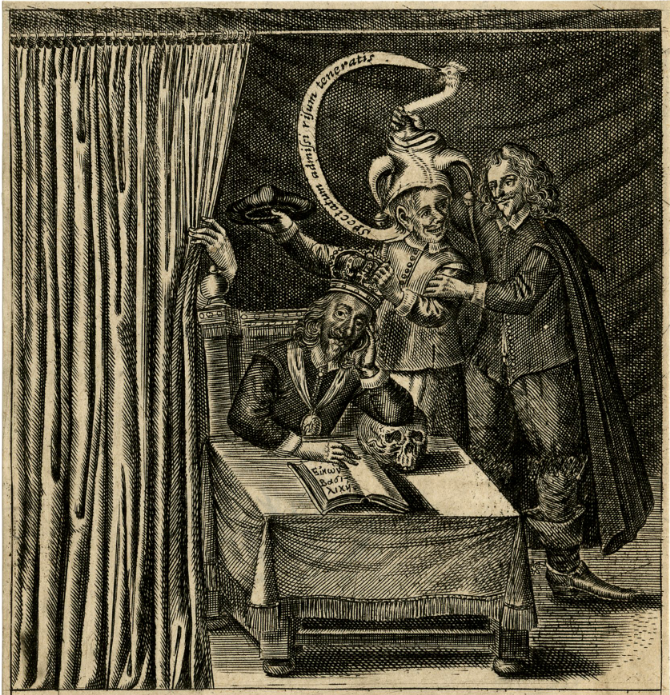 Again a disembodied hand pulls back a curtain to reveal the author of Eikon Alethine as a fool, having a jester’s cap placed on his head. He is trying to whip the King’s crown from his head whilst poised to replace it with a square cap in his right hand, an indication that many people thought (actually not without cause) that the King’s book had been written by a cleric. The King looks particularly fed up, perhaps writer’s block? All a bit complicated, but not unusual for the times, there were often exchanges in the printed press like this, very much like in the tabloid press we have now. Anyway, the three figures are wearing doublets, the fool has tabs cut up to the waistline with no obvious waist seam; whilst the chap with the cloak seems to have a longer bodied style, one of those gravity-defying collared cloaks that were the fashion and a nice pair of square toed boots. The jester’s cap is one of the traditional eared ones with bells.